The next round of homeschool calendar pages is here! You can read a little bit more about how I use them and my reasons behind creating them here, in last years’ calendar release. If you’ve been around for long, you know that I have a slight planner addiction, and they need to be aesthetically pleasing (as well as functional) to make the cut. However, when it comes to homeschooling calendars and planners, it was even harder to find what I wanted that actually fit our Charlotte Mason homeschooling style. Most homeschool planners take a lot of arm twisting and white-out to plan for term-based poet studies, narration, dictation and the like. It’s possible, but I wanted something that was specifically designed for a Charlotte Mason homeschool day. This calendar is the perfect compliment to my new Charlotte Mason Multi-Year Naturalist Planner and you can grab one here! My 2016-2017 Charlotte Mason inspired homeschool calendar pages are perfect for planning out some of those hallmarks of a Charlotte Mason education…poet study, artist study, handicrafts and habit training. Each page features a nature themed watercolor image that is the perfect compliment to your nature journals and study of the living world. Stick it in your planner or hang them in your home as a pretty reminder, building that atmosphere of learning and appreciation. And a quick tip – when you print out your calendar, I definitely recommend springing for a high quality paper, like this. It’s the happy medium between regular old printer paper and the 110 lb. card stock that I use. I wasn’t sure it was worth the extra cost, but I always felt like home-printed sheets never measured up to store-bought and they always felt “cheap” and, well, homemade. The paper quality was the reason why, and paying a few extra dollars for a nicer paper makes all the difference in my book, especially knowing that I will get a school-years worth of use out of them in my planner! It’s not as see-through, there’s very little pen bleed, and it just feels nicer. And now I sound like a paper-nerd. Enjoy your upcoming school year with these simple naturalist calendar planning pages! 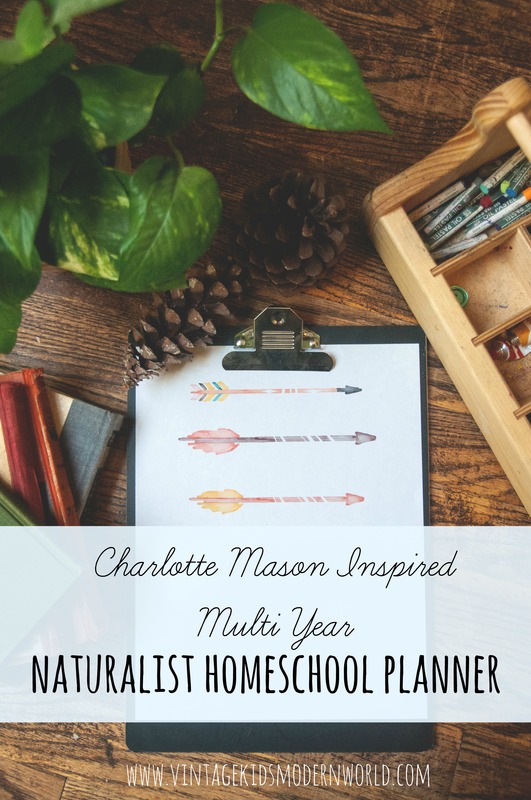 Make sure to check out my corresponding Charlotte Mason Inspired Naturalist Homeschool Planner here! This entry was posted in Homeschooling, Printables and tagged Charlotte Mason, Homeschool calendar, homeschool schedule | Bookmark the permalink. It’s beautiful, Kelsi! Thanks so much for sharing it with us at Allergy Free Thursdays! Did you pain the flowers yourself? Ahhh, I have found a kindred spirit..! ☺️ I too have a planner thing.. always have! I am a naturalist at heart, an artist, with 4 young kids, a love for Charlotte mason and it seems like no time.. so thanks a million for creating these for others like me to ultilize, be inspired, and enjoy the simplicity, beauty, and clarity. Sooo appreciated. It’s all supposed to be simple, but at times homeschool seems so complex to pull together; I love how you really visually and organizationally expressed that perfectly. Captures the spirit of the work, and helps us moms keep our vision simple & straight/clear. 🙂 keep up the brilliant work. aw, thanks!!! so glad you enjoy it!! I’m working on the next version to be released this spring! thanks! These are really beautiful, I look forward to your next release! Hi there.Calendar pages look beautiful. Wondering when the 2017-2018 calendar pages will be up. This planner is beautiful! I was wondering if there would be a 2017-2018 version coming out soon. Thank you! These calendar pages are so beautiful! I was wondering if/when the set for 2017-2018 would be available. I just purchased your multi-year planner and am excited about that as well. Thanks for offering these lovely resources! Just wanted to let you know that your August 2016 Calendar has two 20ths and no 31st. I thought you might just write over the old calendar when you make 2017-18, and you might not catch it. I love your planner and calendars. They are so beautiful. Love these! So gorgeous! Do you have them done up for 2017-2018 by any chance?